A couple of years ago there started to appear notebooks that seemed to violate the concept of mobile personal computers at first glance. Large dimensions, weight, and a short battery life are not favorable to real mobile work. Come to think of it, there are different types of mobility, and computers can be used not only for work, but also for entertainment. So, the appearance of notebooks with a wide 20" panel weighing over eight kilograms is just an evolution of the concept of a multimedia notebook. Indeed, the real [not personal] multimedia implies a large screen, so a notebook won't be small. An important peculiarity of modern video materials is high requirements to CPU performance. A gaming model must also possess a fast video card. Add a large volume of memory and RAID with two hard drives. 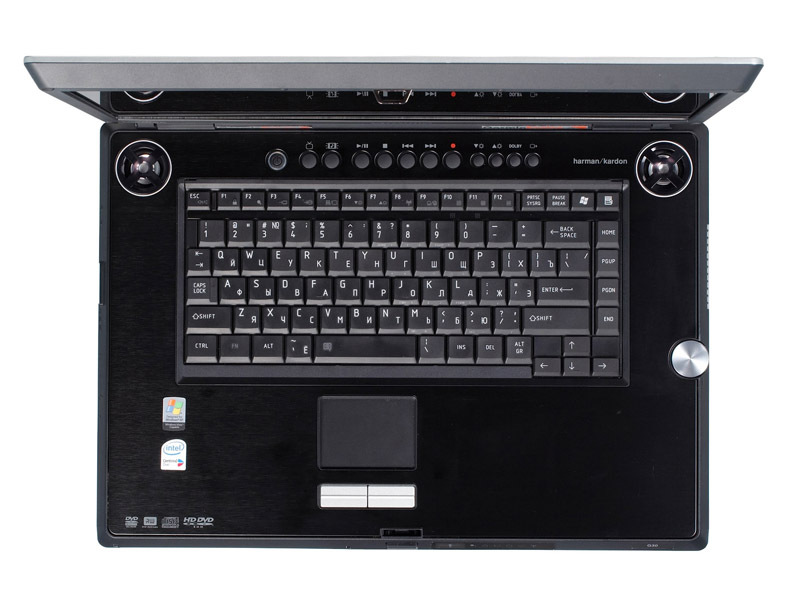 The G30 series includes other notebook models that differ from the top G30-154 in their multi-format DVD drives, processors, and RAM size. The company plans to launch G30 notebooks with new Intel Core 2 Duo processors. recording: 16x CD-R, 10x CD-RW, 4x DVD+-R, 2x DVD+-R DL, 4x DVD+-RW, 3x DVD-RAM. TV tuner is based on the CX23418 chip from Conexant Systems, Inc. It supports hardware MPEG2 encoding and stereo audio. Reception quality is up to the mark even when the signal is relatively weak. The sound card, based on SigmaTel HDA, allows to use an equalizer. Besides, it supports Dolby Pro Logic II and Dolby Digital Live. This very codec also supports the analog modem. The video adapter is based on the NVIDIA GeForce Go 7600 (8pp, 5vp) chip. It's equipped with 256 MB of dedicated DDR3 memory, 128 bit bus. Default operating frequencies are 450/450 MHz. You can reduce power consumption by using "performance/balance/powersaver" settings in NVIDIA driver. These settings have a significant effect on gaming performance – fps in Half-Life 2 goes down by 2-5 times depending on a mode. We didn't find out how this parameter affected the battery life. 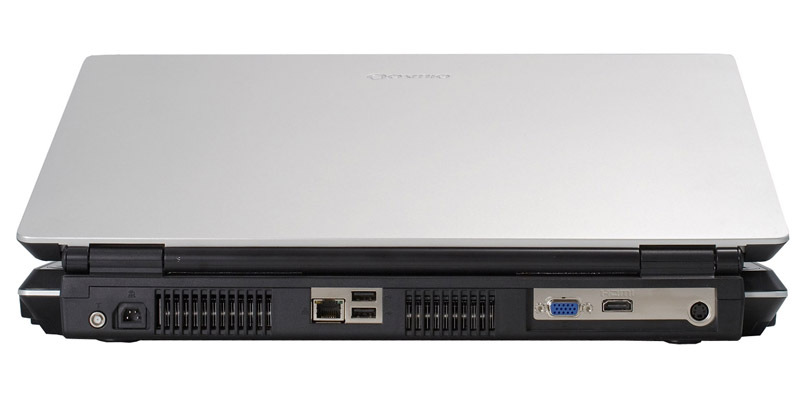 Communications are represented by Intel PRO/1000 PL and Intel PRO/Wireless 3945ABG. There is also Bluetooth 2.0 adapter and V.92 software modem. Photos fail to describe the Toshiba G30 exterior. The main problem is certainly the size. A wide 17" panel and nearly five kilograms – that's serious. Some notebooks are thinner than just a display lid of the G30. But you should understand that it's the cost of unique entertainment features of the notebook. We'll talk about using G30 in this way a tad later. As for now, we'll stick to the main procedure. 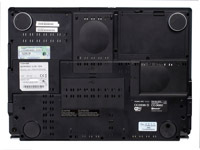 The left side of the front panel houses the HD DVD optical drive. Unlike G20, G30 uses a drive with a tray. It's so inconspicuous, that I couldn't get used to the eject button for a long time – it is very difficult to find it by touch. The right flank houses a group of LED indicators, IrDA port for QosmioPlayer, and a wireless adapter switch. The group of indicators is standard – power, power mode, battery status, HDD activity, optical drive activity, and wireless network. Thanks to the bevelled surface, you can see the indicators both when the notebook is closed or open. There is a sturdy latch in the middle of the front panel. But it easily opens. You can open the lid with a single hand, thanks to the form of the lid edge. The right flank houses a volume control, easily accessible even with the closed lid. Unfortunately, unlike Q20, there is no indicator of the current volume level. Unlike the standard behavior in other devices, you should turn the control counterclockwise to increase the volume. The same flank also contains audio-video outputs of the built-in TV Tuner: 3.5'' mini jack for the composite video/stereo audio and S-Video. The modem port is also placed here. The left flank contains more connectors: two headphone output ports (one of them is shared with S/PDIF output), microphone input port. The model under review has a built-in mike as well (it's approximately in the middle of the front panel), but we found it accidentally, when we tested Windows Vista Beta. Other connectors: 4-pin i.LINK/Firewire, expansion card slots – 1 x PC card and 1 x ExpressCard, SD/MMC/MS/xD card reader, and 2 x USB. Interestingly, the latter ports are arranged vertically, though the horizontal layout would have taken almost as much room. The rear panel contains exhaust vent holes and several connectors. The right group features video outputs - S-Video, HDMI, and VGA. LAN port and the second pair of USB ports are in the middle. A power jack and antenna port for the TV tuner are on the left. 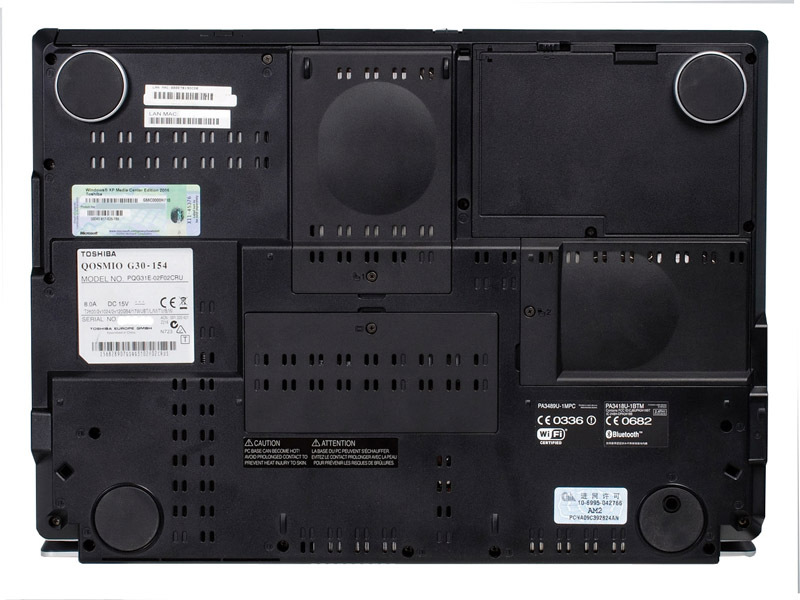 The bottom of the notebook contains a lot of vent holes and several compartments to install memory, hard drives, and a battery. The latter has unexpectedly small dimensions and weight for such a monster. 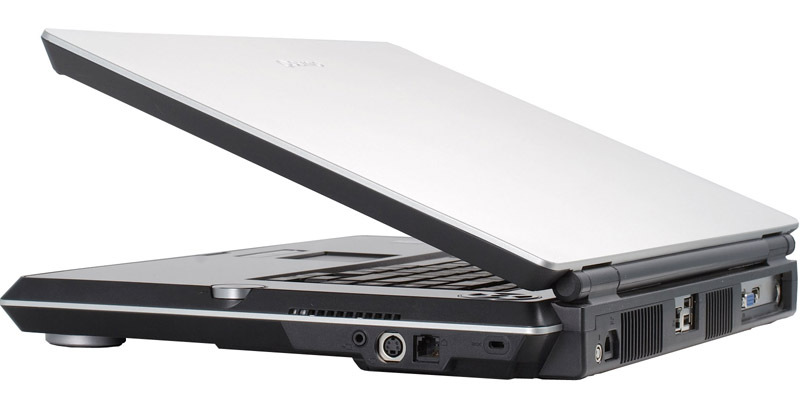 By the way, the notebook itself weighs 4750 g. As the power supply unit is practically a must for such powerful systems, add another 800 g.
The notebook looks good with the open lid. This model resembles Q20 much, but there are some differences as well. The most significant is the use of metal alloy instead of plastic for the top panel, which makes the model look much more reputable. 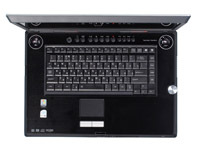 The other points are less significant: a media player is controlled with buttons above the keyboard instead of sensors, the volume control lost its volume level indicator, and some other indicators (HDD and wireless activity, in particular) were moved to the front panel. Stereo speakers in the upper part of the panel have removable plastic grates (probably to make it easier to remove stray objects :). Combinations of the Fn key together with functional buttons allow to switch between power saving modes, block the system and touch pad, control display brightness, wireless communications, and external monitors. There is a very good feature for a high resolution display - you can quickly switch to 1024x768 or 800x600 using Fn+Space, because working in the native resolution is rather difficult - you are "scraping" the panel with your nose. Along with the notebook and the AC adapter, the bundle of our sample included a remote control (similar to those for MCEPC Fujitsu Siemens SCALEO E and Acer E650, but this device is black and has no teletext buttons), external receiver with a USB cable and a single IR-transmitter (it was also used with Acer E650), HDMI cable, 3xRCA cable for the mini jack to connect external audio-video sources, TV adapter and a 3m antenna cable, a phone cable. Besides, the box contained some printed materials – User's Manual and some other booklets. Note that the notebook manual is rather thick and provides complete information about its usage. But some peculiarities, like settings of the TV Tuner, are described only in the electronic version. You can also buy a Kensington lock, external floppy and optical drives, power supply unit, memory modules, and a bag. 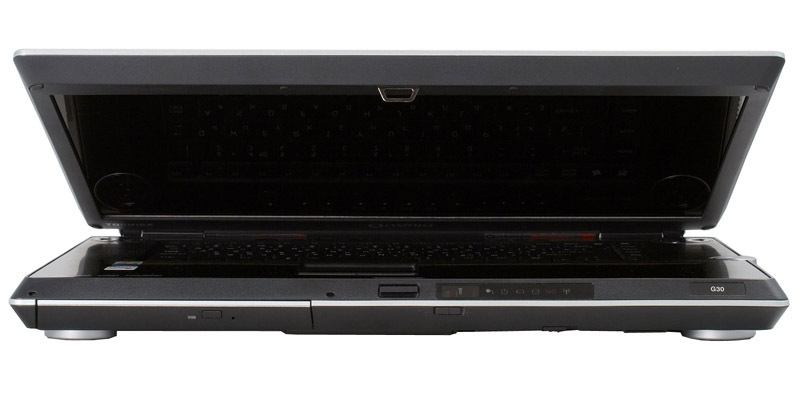 InterVideo WinDVD: a standard DVD player. Version 5 with DXVA support (DVD playback loads a CPU by 10-20%. Note that it's not quite correct, because CPU clock varies from 1000 MHz to 2160 MHz). InterVideo WinDVD HD for Toshiba: special version of the player for HD DVD. It offers only basic functions of HD DVD playback. InterVideo WinDVD Creator 2: entry-level program to create DVD using ready videos or captured fragments from your camcorder or TV tuner. Microsoft Office OneNote 2003: it's used to manage notes – create, manage, search, share. It's more convenient to use in Tablet PCs with styluses. Sonic DLA: a counterpart of Ahead Nero InCD, it allows to use (re)writable optical discs as usual removable drives. Sonic RecordNow! : a program to record optical drives. The basic version can record data, audio discs (CDDA), and copy them. You can also buy a Deluxe upgrade (from $30 to $100), which significantly expands program features. The maximum version also allows to edit and record video. Norton Internet Security 2006: a famous antivirus and firewall, update subscription for 90 days. Toshiba software is diverse and really facilitates your operations with the notebook. It's impossible to describe the whole bundle in a single article, so let's dwell on the most interesting issues. It should be noted that most programs are localized. Company logo is born by the drivers and Bluetooth programs (stack 1.1, 1.2, and 2.0), RAID, modem, communications, DVD-RAM driver. Security includes two programs to set passwords – Supervisor Password and User Password. You can actually use only the latter. The former is more interesting for corporate users. It creates another higher access level for a system administrator. The system prompts for password before the OS loads. You can also specify a text message (English only) to be displayed before the password is requested. When NIS is installed, its icon is available here as well. "Protect and repair" consists of programs to diagnose a computer, archive data (standard system application), restore a system (ditto), a library of drivers and programs (you can create a CD with them), RAID utilities. "Optimization" - power management, SD card formatter, pointing device configuration, Fn settings, Zooming Utility, settings for additional keys (record, brightness Up/Down, Dolby, TV-Out), optical drive modes – quiet or usual), configuration of hardware devices (BIOS counterpart, we were interested in the bootup order (you can change it on the fly by pressing F12 when you turn the notebook on) and CPU speed (dynamic, always high, or always low)). ConfigFree is probably the most convenient program for managing network connections I have ever seen. It automatically switches between network connections (Bluetooth, Wi-Fi, LAN) as well as their profiles to provide constant connection to Internet. The profiles may store network settings (for example, IP addresses, Wi-Fi network name, and encryption key) as well as OS settings (default printer, parameters of access to files and printers, etc). 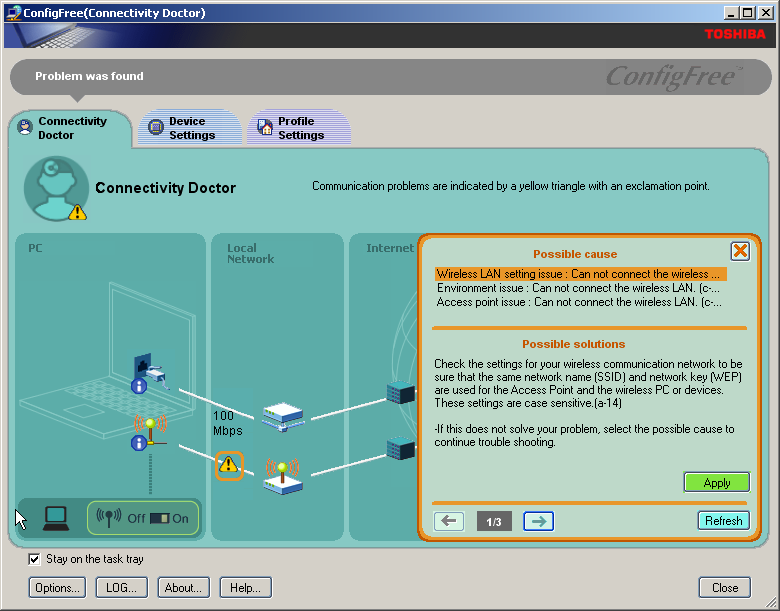 If you have problems with network connections, you can use Connectivity Doctor, included into ConfigFree. This program visualizes settings of all network devices and helps detect the problem. There is also SUMMIT. This program allows to use virtual conferencing among PCs with the same software - you can chat and exchange files. Unfortunately, our ConfigFree version was only partially localized. 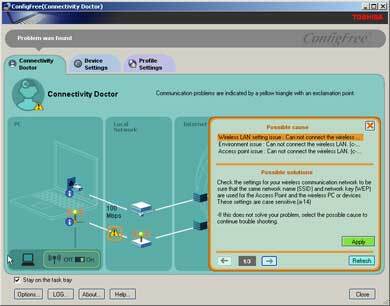 PC diagnostic utility provides complete information about the hardware configuration of your system and installed drivers. It can also be used to test basic functionality of the main systems of your computer (processor, memory, hard drives, etc). Notebook manufacturers often bundle their products with special power management programs. Toshiba is not an exception, having installed Power Saver on G30. It offers better features compared to the standard OS utility. In particular, it uses such settings as screen brightness (including binding to a battery charge level), CPU clock rate control, cooling system control, disabling some secondary devices. Besides, it offers extended functions to alert users about low battery. The basic version uses seven profiles, and you can create custom ones. Zooming Utility allows to use hot keys (Fn+1/2) to zoom the output of supported programs in or out. It supports such programs as Internet Explorer, Microsoft Office, Windows Media Player, Adobe Acrobat. Touch and Launch is a very interesting utility, it accelerates launch times of programs or execution times of certain actions. When activated, holding your finger in a corner of the touch pad calls a custom window (different for each corner) with shortcuts. To start a necessary program, you should move your finger to the shortcut and break the contact with the touch pad. File copy utility in QosmioPlayer lets you copy video files, recorded with QosmioPlayer, to a Windows partition. You can delete files from the hidden partition after copying. QosmioPlayer is described in detail below. The notebook also comes with a system restore DVD-ROM. When you restore a system, you have an opportunity to change the RAID configuration (no RAID, RAID 0, RAID 1) and install the system on the first partition without splitting the drives. Only the system partition is formatted, so your data on the second drive will be preserved in case of two drives without RAID. 37000 files and 2500 folders were restored (overwritten from DVD-ROM) for less than half an hour. The first startup of the restored system takes up more time. Results of the panel tested according to our standard procedure are published in the table. Increased resolution, compared to the previous Q20 model, resulted in the increased response time, lower brightness and contrast. But these results look good versus those obtained for 15" notebooks tested this year. Besides, Q30 takes the second place in panel brightness after G20 among all models. So this notebook can be used for any tasks even under bright external light. What concerns color rendition, it's even better than in G20 according to SpyderPRO colorimeter. Angles of view are also more than sufficient for an entertainment center, to watch movies in a small group of people. G30 allows to watch TV and DVD without booting into OS. This is possible due to a special player - QosmioPlayer. You can start it by pressing the TV or CD/DVD button on top of the keyboard, when the notebook is turned off. It takes less than ten seconds to load the player. The program is actually installed on a special 4GB partition on the first hard drive. The same partition is also used for TimeShift and video recording. You cannot get access to it with standard tools, but the bundle includes a special program to copy recorded video files from this partition. QosmioPlayer can output video only to the notebook display. But you can certainly play audio via the built-in speakers, headphones, or an external sound system. You can control the player with the keyboard (special keys in the upper row and some buttons in the main group) and with a remote control. Signals from the remote control go to the receiver near the group of indicators. The remote range in this case exceeds five meters. But you should point the remote control well. The player can be configured only from the keyboard, mind it. Here are the available TV parameters: region/TV standard, image settings (presets and manual control of brightness/contrast/color, sharpness, noise reduction, 3D Y/C, 4:3 ratio), record quality (720x576, 25 fps, three video bitrates (7776, 3776, and 1776 Kbps), audio is always 48 kHz, stereo, 224 Kbps). Along with TV programmes, QosmioPlayer can play DVD and CD-DA. In the first case, you get access to such standard settings of DVD players as language and subtitles. Unfortunately, you cannot stretch 4:3 video to wide screen. In case of audio discs, the player offers standard features only as well – track navigation (including track selection with digit keys), shuffle and navigating the track in both directions. Traditionally, we tested battery life with BAPCO MobileMark2005. We also published the performance score in parentheses for the Productivity test. What concerns performance, Toshiba G30 is certainly one of the leaders. According to our Productivity 2002SE Performance results in 2006, its competitors are ASUS V6J with a similar processor and GeForce 7400 video card and Acer TravelMate 4670 with T2500 and ATI Radeon X1400. Battery life for the Productivity pattern is nearly three hours, quite a decent result for such a powerful model. Notebooks with integrated video certainly lead in DVD playback (a top result in this test is about four hours). But Qosmio G30 will also play most full-length movies without connecting it to a wall outlet. Testing this notebook in the Reader pattern is unusual, but it also fares well here – over three hours. We haven't tested browsing web pages over a wireless connection much, so it's hard to analyze the situation. We can compare the result only with the Reader pattern - the wireless adapter "gobbled" almost 15% of the battery. 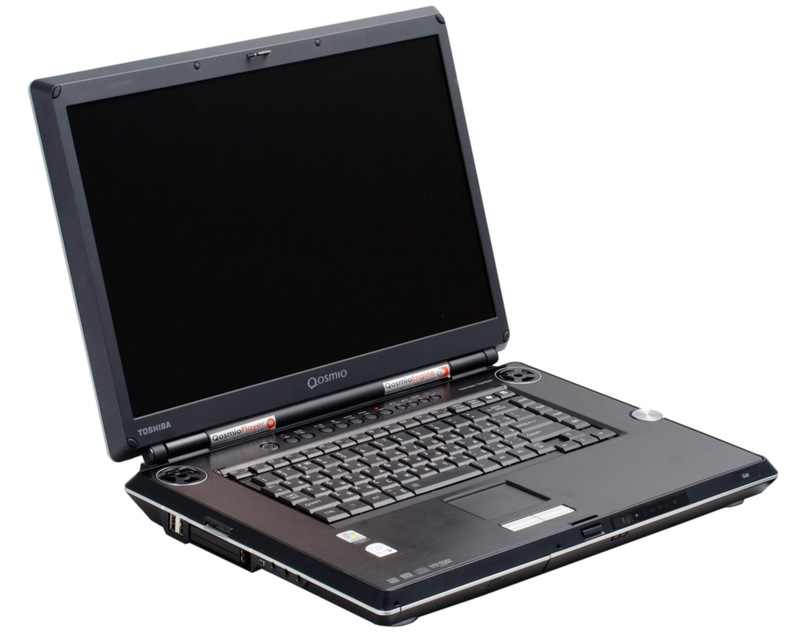 Thus, Toshiba Qosmio G30 can be used as a mobile device after all, despite its large display, powerful processor, discrete video, and two hard drives. But you shouldn't forget that the G30 battery offers the highest capacity we have ever seen, such high results are demonstrated mostly due to this battery. Power Saver profiles change nothing in the Productivity test – battery life and performance results match those taken in Portable/Laptop mode. An additional Reader test with Power Saver set to long battery life increased the battery life from 190 to 218 minutes. The video accelerator allows to run rather heavy games. We obtained the following results in FutureMark 3DMark03: 640x480 – 14118, 800x600 – 12020, 1024x768 – 9372, 1280x1024 – 7003, 1440x900 – 6942, 1600x1200 – 5366, 1920x1200 – 4662. It's rather problematic to compare our results with desktop systems. But we may remember our tests of the Intel Pentium 4 3.06 GHz in February, 2003 - 5120 points were demonstrated by an overclocked video card based on ATI Radeon 9700 Pro. Toshiba Qosmio G30 easily takes the first place in the segment of mobile computers. It breaks away from the nearest competitors by almost 1.5 times(!) – ASUS A7Jc (X1600), ASUS A6Ja (X1600) and Toshiba Qosmio G20 (GeForce Go 6600). We also used Half-Life 2 to assess video performance according to our CPU and 3D Video section procedures. The first one (read the description of the procedure) demonstrated 115/115/111 fps, which is approximately on the level of Athlon FX-60 and Pentium XE 965 systems (remember that we use GeForce 7800GTX 256 MB to test processors). According to the 3D Video section (tests are carried out with the same processor, we have been using AMD Athlon 64 X2 5000+ of late), Toshiba G30 offers performance on the level of NVIDIA GeForce 6800 XT (1024x768 – 90, 1280x1024 – 74, 1600x1200 – 61). We can say that this notebook can be used for games of the previous generation, which do not have high requirements to the video system. That's the merit of a fast CPU and a fast mobile GPU. The 16:10 display can be of inconvenience, because there are unfortunately few games adapted for this resolution. Microsoft Windows Media Center Edition for notebooks is actually no different from this operating system for desktops. But you should understand that positioning notebooks as entertainment centers for more than one person is wishful thinking of marketing specialists rather than reality. Most notebooks can be connected to a large display and powerful speakers, of course. But that's not their standard usage model. On the other hand, the panel size and the power of the built-in speakers allow to use G30 for watching movies in a small group of people. We should mention an important peculiarity - it's not enough to have just a remote control and a notebook to control the device. Even though the notebook is equipped with an IR receiver, which works fine with QosmioPlayer, you have to use a bundled external receiver for MCE, which significantly damages mobility of the system. It's not quite clear why the manufacturer failed to integrate MCE support into the notebook. Let's hope the future modifications of entertainment centers from Toshiba will not have this problem. The notebook can be connected to external displays via VGA, HMDI, and S-Video. Owners of large LCD monitors should keep in mind that the digital interface supports only devices with HDCP. Another limitation exists for playing HD DVD video – it can be done only with the built-in display or via HDMI. External speakers can be connected to the standard stereo jack or optical S/PDIF. The HD DVD optical drive is undoubtedly the spirit of this notebook. Our web site offers several articles devoted to the new format. In case you have missed them, the main difference between HD DVD and the old DVD is higher capacity – 15 GB per layer/side versus 4.7 GB for DVD. All the other features have to do directly with this increased capacity. In particular, new video and audio codecs, support for high definition video, interactivity. There is another article devoted to using Toshiba G30 for HD DVD playback on the Digital Home web site. The first model of a notebook from Toshiba that can play high definition video aced our tests. Excellent performance, unique technical characteristics, and rich features make Qosmio G30 a nice choice for all those people who love to be on the multimedia edge. The notebook gets the Original Design award for an excellent combination of state-of-the-art technologies. Excellent Package award is given to this product for the excellent bundle of localized software.